Section 3.4 – (lien avoidance) Please include the dollar amount of the exemption in column 4 as well as the appropriate statute. Also, in the last column, please use “100%” or “all” instead of a dollar amount, as the claim may not match your figure. Under Bankruptcy Rule 3015(c), nonstandard provisions must be set forth below. A nonstandard provision is a provision not otherwise included in this form or deviating from it. Nonstandard provisions set out elsewhere in this plan are ineffective. The following plan provisions will be effective only if there is a check in the box “Included” in 1.3. If the date you file the Amended Plan is less than 28 days prior to the original confirmation hearing, then there isn’t enough time for it to be heard on the original hearing date. Therefore, you will need file and serve a new Notice of Confirmation Hearing along with the Amended Plan, choosing the next available hearing date that is more than 28 days after you file the plan. You have to serve all creditors with both the new plan and the Notice of Confirmation Hearing. Make sure the Notice of Confirmation Hearing includes the date of the plan it refers to. After the original confirmation hearing has already occurred, but before the case is confirmed, every time you file a new plan, you will also need to file and serve a new Notice of Confirmation Hearing along with the Amended Plan, choosing the next available hearing date that is more than 28 days after you file the plan. You have to serve all creditors with both the new plan and the Notice of Confirmation Hearing. Make sure the Notice of Confirmation Hearing includes the date of the plan it refers to. After the case is confirmed, every time you file a new plan, you will also need to file and serve a Motion to Modify Plan After Confirmation and Opportunity for Hearing along with the Amended Plan, choosing the next available hearing date that is more than 28 days after you file the plan. 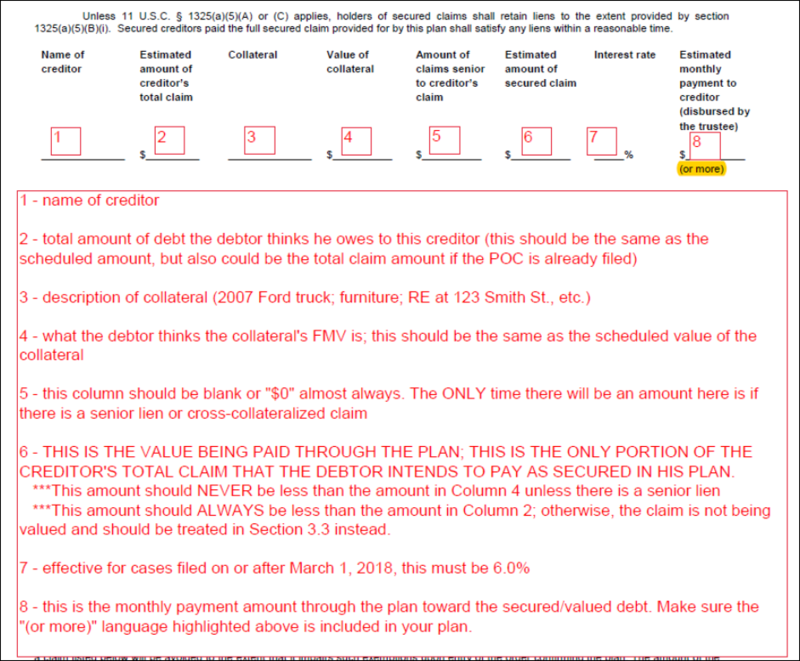 You have to serve the Amended Plan together with the Motion to Modify only on creditors who are or may be adversely affected by the modification. THE PLAN DATE MUST ALWAYS BE INCLUDED IN THE FIRST SENTENCE OF THE NOTICE OF HEARING.